The demand for plastic foams in the US is forecast to rise 4.1% annually to 8.6 billion pounds in 2017, reaching a market value of US$24.7 billion, according to a new report by the Freedonia Group. The market will mount a healthy recovery from the declines posted during the recession-impacted 2007-2012 period, Freedonia analyst Bridget McMurtrie noted. “The construction sector is anticipated to enjoy particularly robust growth prospects, as renewed strength in construction activity generates significant opportunities for foam insulation products,” he says. 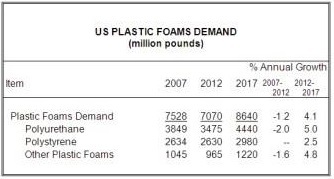 Packaging will remain the leading outlet for plastic foams through 2017, accounting for nearly one-third of total volume, the US-based market research company predicted. Increased new housing activity, along with rising consumer spending levels, will bode well for foams used in household products such as bedding, furniture, and appliances. In the motor vehicle market, advances will be promoted by rising vehicle output and efforts to enhance safety and comfort. Polyurethane (PU) represents the leading resin in the plastic foams market, the report said. Flexible PU foam will remain the dominant product type of this resin, outpacing demand gains for its rigid counterpart through 2017 based on especially rapid growth in the bedding and carpet underlay markets, where it is valued for its cushioning properties. Strong gains for rigid PU foam will be propelled by a healthy rebound in construction activity and by changes in building codes and construction practices that call for structures to use energy more efficiently. Rigid PU is one of the most effective materials available for roof and wall insulation, insulated windows and doors, and air barrier sealants. However, PU foam insulation will continue to encounter competition from fiberglass and polystyrene foam. Polystyrene (PS) accounts for almost two-fifths of demand for plastic foam and will maintain a sizable share of the market through the forecast period based on its excellent protective and insulation capabilities, moisture resistance, and low cost, according to Freedonia. However, advances in the large packaging sector will be restricted by ongoing solid waste disposal concerns regarding the use of disposable foam products and rising competition from paper-based materials, which are viewed as more eco-friendly. Through 2017, expanded polystyrene (EPS) foam is projected to see more rapid gains than its extruded counterpart, stemming primarily from its use in insulation, molded foam protective packaging, and insulated shipping containers, forecasted the report. EPS geofoam is predicted to exhibit especially rapid growth, albeit from a relatively small base.